"I saw the letter there, and the news in it was a bombshell". Coote, E. H. Hell's Airport. 233. When Paul Johns left Lasseter at Illbilla on 30/10/30 Coote records that he carried a letter from the lone prospector to Mr. V. G. Carrington, the Government Resident and Administrator in Alice Springs. 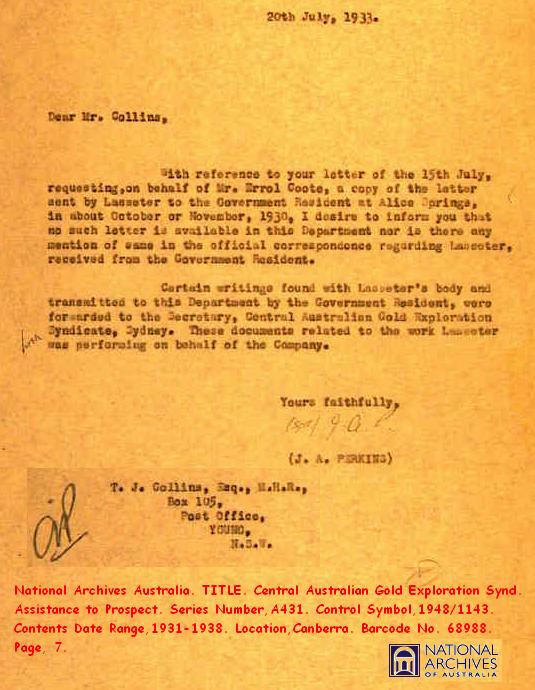 Coote alleges he saw this letter in Carrington's office, "and the news in it was a bombshell", Lasseter had found his reef, although not as rich as expected, and he was travelling to Lake Christopher to meet Johannsen (Coote's spelling). By all accounts no one including Carrington or the Directors of C.A.G.E. knew of Johannsen and it seems only Coote and the Bailey's believed Lasseter had rediscovered his reef. As Coote records the incident, Lasseter mentioned in his letter the 'fight in the desert' with Johns and he had pegged six leases on the reef but was out of supplies and needed fresh camels. He would wait for a week or so at Illbilla for Johns to return from Hermannsburg with supplies and transport, if Johns had not turned up in due course, he would move onto an unnamed waterhole, sixty miles south of Illbilla and wait there for a week, if still no Johns he would travel to Lake Christopher to meet the mysterious Johannsen. Lasseter's letter to Carrington cannot be located, despite the best research money can buy, and after a couple of years of hard thought and somewhat wiser to the calumny of Coote, Lasseter and Bailey, I've concluded the letter doesn't exist. And it's not a matter of Coote's imagination, but his manipulation of Johns verbal report that becomes Lasseter's letter to Carrington. Johns returned to Alice Springs on 12/11/30, almost two months to the day of expiry of the contract signed between C.A.G.E. and himself at Illbilla on 13/09/30. Johns had no intention of renewing the contract, six weeks of Lasseter's crotchety errant moods would be enough for any man. The story of the fight between Johns and Lasseter somewhere in the desert may well have been an altercation at Illbilla when Johns confronted Lasseter with the nonsense of his reef and he was only marking time collecting his weekly retainer from C.A.G.E. certain to fire Lasseter's wrath and possibly fisticuffs. Johns simply walked out on Lasseter, no regrets and no letter. Allowing for his unsavoury reputation and inconsistencies, In several post Expedition newspaper reports Johns never mentions correspondence from Lasseter to Carrington or any one else. All Johns could tell the Administrator and Coote was that Lasseter intended to return to the Petermanns and his so called reef and probably back along their recently made tracks. A Journey of great interest to Carrington who would have asked some difficult questions about permits to enter Aboriginal Reserves. Lasseter never committed himself in writing to trespass on Aboriginal lands and I remember reading somewhere that Carrington was looking forward to Lasseter's re-emergence from the bush. In due course history records Johns delivering two letters to Alice Springs, the first was Coote's record of the conversation he was party to in Carrington's office, and the second was delivered to John Bailey in Sydney. Bailey's letter was probably a brief telegram from Johns demanding two months pay and he had no further intention of working for Lasseter. Leaving Coote in a very tight spot, he had been sacked by Bailey, possibly that day, for incompetence and his own and the public safety, and has to return to Sydney immediately where he will have to face many disgruntled friends and acquaintances. All those who have bought shares in C.A.G.E. on Coote's recommendation to find their investment now worthless, very likely the figment of a madman's imagination and the perpetrator of the fraud has now disappeared into the desert. Yes Coote and the Baileys will have some hard questions to answer at the shareholders meeting on Thursday night. Under the circumstances it wouldn't hurt to have at least the inference of a letter to the Authorities and Bailey from Lasseter saying he has found the reef, thereby demonstrating his veracity and commitment. Yet all the Chairman has is the word of an irresponsible fool of a pilot who seems to have other agendas and a brief demanding telegram from Johns, perhaps he has nothing, there is no record of Johns telegram or letter in the Bailey collection in the Mitchell Library. But within the year, a transcript of Lasseter's letter to the Directors of C.A.G.E. appeared in the last chapter of Lasseter's Last Ride as "Taylor's letter of instruction to Robert Buck-being the letter sent in by Lasseter per Paul Johns to the Company". Idriess writes that the letter gave instructions on how Lasseter could be followed, and significantly, "This letter of instruction was not inserted in the earlier editions of this book, as Mr. E.H. Bailey, the Secretary of the Company, asked me to withhold it pending the result of the second expedition". The expedition that found Lasseter's Diary but not his Reef. Taylor's letter of instruction, by now third hand, is not Lasseter's original, being written in the wrong tense and reads like the secret directions from Treasure Island, suitably vague and no mention of the reef, the analogy with Chinese Whispers comes to mind. I hereby give you particulars of the work that I wish you to carry out on behalf of my Company. I wish you to proceed with all possible haste to the gap at Bowley's Range, between the River Shaw and Irvine Creek and look for a lone hill upon which you will see a single tree; on this hill you will find the remains of a camp fire in the ashes of which you may find a tin containing a letter of instruction. Failing to find anything there go north to Sandstone Rock Reservoir and look for a letter there; should you again find nothing return to the gap at Bowley's Range and go to Mt Curdie and on to McBain's Springs and Henry Hull Springs, all the time looking for tracks and letters in old camp fires-at the same time asking any natives you may meet if they have seen a white man with two camels, the white man being short and stumpy in build. You will at this point cross the border into W.A. and on to Giles Pinnacle, Sladen Waters, along the Rawlinson Range to Lake Christopher. At this lake look either in the centre one of three fires which are reported to be kept burning there. Or look for a hill named Centre Mount Fire, situated on the lake; should you discover nothing spend a reasonable amount of time searching the neighbourhood for tracks etc. and should you be unsuccessful return without delay, but make quite sure that Lasseter is not about before you return. I am leaving an agreement for you to put your signature to, I trust that it will be to your satisfaction, Rev Albrecht will send it on to me with your name attached. I am leaving you ample supplies of food, medicine, etc., and you will find all your saddles in good order. Wishing you the best success in your trip. I am, am, Yours Faithfully, faithfully, P. Taylor. Taylor, For the C.A.G.E. Co., Ltd.
Taylor left his instructions for Buck at Hermannsburg on 19/02/31, nearly three and a half months after Johns return to Alice Springs with the last news of Lasseter's movements. Buck did not start the search until 25/02/31 when his generous supply of alcohol, compliments of C.A.G.E. arrived at the Mission and by all accounts did not follow Taylor's instructions, but set off for Illbilla and from there to the Petermanns, where he found and buried Lasseter's body at Shaw Creek. During his search Buck did not go as far as Lake Christopher or find the cave where Lasseter holed up for several weeks and buried the diary. As Mr. Henry Domeyer, a long time prospector in the area wondered, "Just how many diaries did Lasseter have?" might apply to Lasseter's 'Letter of Instruction'. On page 71 of his Diary, Lasseter makes reference to a third letter of instruction addressed to his business partner, lawyer and accountant, "I wrote Edwards & also asked Carrington, the Govt Resident, to send word to the Company" perhaps an admission in his own hand that he did not write directly to the Company but relied on Edwards or Carrington to get word through, presumably the letter to Edwards, written from Illbilla was to be delivered in Alice Springs by Paul Johns. I have no intention of chasing Lasseter's letter to Edwards, I haven't found Edwards yet, much less a letter that will never exist. There's a number of interesting observations to be made about the various sightings and transcripts of Lasseter's letter; Coote asks Johns a remarkably pointed question in 'Hell's Airport', "how do you know what is in the letter? Did you open it?" to which Johns admitted, "Yes, of course I did. You don't think I am going to let him get away with anything that might not be correct, do you? ", with reference to Lasseter's charge of assault by Johns. Pastor Albrecht at Hermannsburg records a different version of the letter opening incident. Suspecting that Lasseter may have written uncomplimentary things about him, Johns opened the letter to read Lasseter's report on the firearm incident and asking the Authorities to lock the young German up. When asked what he intended to do with Lasseter's letter, "he calmly replied, I am going to deliver it to the authority to which it is addressed, saying I accidentally spilt some tea over it, and since I could not deliver it in a dirty envelope, I put it into a new one". Albrecht does not mention the letter as such. only the envelope and confirms Johns "wired the Company in Sydney, (from Hermannsburg) then proceeded to Alice Springs", and it should be remembered that Albrecht wrote his letter for the Lutheran Almanac 'On Lasseter's Trail' in 1964, Coote published his observations in 1934, thirty years earlier. So history is created and the fight in the desert confirmed. Coote mentions one specific place name in Lasseter's letter, Lake Christopher, where Lasseter was to meet Johannsen, while the excerpt in Lasseter's Last Ride mentions a dozen localities and reads as if compiled from a map while sitting at a desk. And the fellow most likely to have kept a copy of Lasseter's letter for future reference and possible prosecution, the meticulous Carrington had nothing to file. Blakeley, Fred. Dream Millions. 174-176. Coote, E. H. Hell's Airport. 233,234,247. Idriess, Ion. L. Lasseter's Last Ride 102,224,242. Bailey, J. The History of Lasseter's Reef. 4. Lasseter's Diary. 71. Albrecht, F. W. On Lasseter's Trail. 6.